You are here: Home 2011 August How can Cisco Benefit from Collaborating with Versly? August 31, 2011, Monday Cisco Systems announced that it was buying Versly, the collaboration tools vendor, for an undisclosed amount. Versly hasn’t yet had a real product, but you can apply for a chance to be in its closed beta on their site. Versly’s ten employees will be integrated into Cisco Collaboration Software Group that also includes its WebEx, Jabber and Quad product lines. It will be offered as a separate service, but Cisco will eventually integrate its features into these three existing services designed for enterprise customers, perhaps as early as 2012. Cisco may believe that broadband-based collaboration is a transformational way for companies and individuals. The San Jose, Calif.-based routing giant made collaboration a big area of focus when it bought WebEx and a slew of other companies. However, its collaboration plans have fallen short of its target. Many of Cisco’s competitors — for instance, Google and Salesforce — are pretty far along in their efforts, and Cisco needs to catch up. It seems Cisco is looking to jump-start its efforts, and for that, it needs a team with deep understanding of collaboration and software-as-a-service business model. Is this a good acquisition for Cisco on a number of fronts? Make no mistake–the acquisition was as much about talent as it is about the product itself. During the latest analyst roundtable with CEO Chambers, he specifically pointed out that the company wanted to bring in more high level application talent; Versly is loaded with it. Versly has talent from BEA, Weblogic, Sun and others including one of the original Java team members. No offense to Cisco, but the company isn’t exactly brimming with application talent, so the Versly team will be a welcome addition into Cisco. Maybe this is not the only acquisition Cisco will be making in the application space, but it’s a good start. Cisco decided to refocus its five main areas (Cisco router, network switches, collaboration, cloud computing, network architectures). So application based collaboration? How does that fit into Cisco? In fact, collaboration has the largest overlay sales force of all product areas at Cisco, so Versly certainly puts another arrow in the collaboration quiver. It also strengthens Cisco Quad and WebEx platforms. Versly is more than just the embedding of presence and e-mail into documents though. 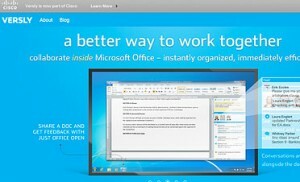 It allows workers to share documents, organize them, merge modified documents and archive them. Workers can do this without having to switch out of the document into another program. Now extend this to Quad where Cisco will have the ability to send automatic notifications when a document has been updated, and the user no longer needs to keep checking it or IMing/e-mailing the other workers to find out if the updates have been completed. This should help extract much of the human latency in document-based collaboration, another fundamental tenet of UC &C.
In summary, when you add up the talent Cisco acquired combined with the ability to move up the stack in the UC &C market, and the low risk involved, for Cisco, the acquisition was well worth it.